1. Look for Zinc Oxide or Titanium Dioxide. These are physical sunscreens, rather than chemical sunscreens. Chemical sunscreens are absorbed into the skin to soak up the wave-lengths of sun so that they don’t penetrate deeper. The longterm effects of ingesting these chemicals is unknown but many chemical sunscreens contain known carcinogens. Another reason to use a physical as opposed to a chemical sunscreen is that babies and toddlers put their hands in their mouths all the time. Zinc oxide and titanium oxide are nontoxic, inert ingredients so they won’t react with any chemicals in the body to cause illness or an allergic reaction. Accordingly, you don’t have to worry about your child ingesting small amounts. One note, titanium dioxide is somewhat controversial. 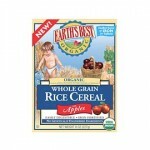 It is a naturally occuring mineral that is chemically processed. Some studies indicated a slight increase in cancer levels in lab rats with long term exposure but others have concluded that the carcinogenicity of titanium dioxide is so low, it’s not classifiable as a human carcinogen. It is currently listed as non-toxic to humans and has no known adverse effects. This substance should be avoided in nano particle or ultrafine form, however. For more on Titanium Dioxide, read this article. 2. Look for Paraben-Free, PABA-Free, Fragrance Free sunscreen. The reasons should be obvious but in short, this will avoid a host of toxic, carcinogenic chemicals. 3. Get Broad Spectrum. It’s the only way to ensure your child is getting UVA and UVB protection. 4. Avoid Aerosol or Spray Sunscreen, Look for Non-Nano. Sunscreens are dangerous if inhaled or if they get in the eyes. Further, new consumer construct “ultra fine” and “nano” sized particles are absorbed at a more rapid rate by the body and penetrate deeper, thereby increasing the absorption of any toxic chemicals in your sunscreen. If you must use a spray sunblock (some is better than none! ), spray it on your hand first, then apply to your baby (or yourself). 5. Check expiration date and monitor consistency and color. Avoid any expired sunscreen and throw out sunscreen that has changed color or consistency. This can affect efficacy and, in the case of chemical sunscreen, increase toxicity. 6. Apply properly and reapply every 2 hours or after swimming. Babycenter has a good video on how to apply sunscreen to your babe here, which should take about 5 minutes if done well. Don’t forget in between fingers and toes, behind ears and the neck and do the face last since it’s the most sensitive area for kids. 7. My sunscreen recommendation is Badger SPF 30+ Baby Sunscreen. It’s broad spectrum, non-nano zinc oxide with mostly certified organic ingredients. 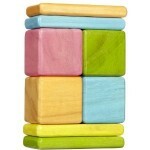 If you’re driving this holiday season, check out Safe Mama’s Top Ten Eco-Friendly Toys for Entertaining Kids in the Car. 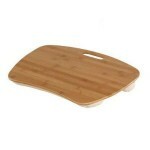 This Bamboo work surface is great for coloring, books, puzzles, etc. and can double as a lap desk at home. Another favorite that (hopefully) won’t end up in the cracks of your car seat are these Tengu magnetic blocks, which you’ll also find in my Registry section. 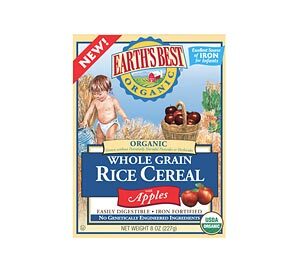 Of course, we have a ten week old so we’re better off with some sleep-inducing drug, aka Earth’s Best Organic Rice Cereal for Infants. I highly recommend Apple flavor mixed into breast milk or formula (check with the doc first). Sodium benzoate is an ingredient that kept showing up on my Burt’s Bees product labels and other favorites that I had long considered ‘safe.’ I finally investigated. Sodium Benzoate is a commonly used food preservative as it’s quite good at killing bacteria and repelling fungi. It is produced by the neutralization of benzoic acid with sodium hydroxide and occurs naturally in low levels in foods such as prunes and apples. Sodium Benzoate is also used as a preservative in cosmetics and certain medicines. Also, keep in mind that factors such as light, heat, and expiration date can affect the rate at which benzene is formed. Research out of the UK as recent as 2007 suggests that sodium benzoate, when combined with certain artificial colors, causes hyperactivity in children. Artificial colors are problematic in their own right as studies link them to cancer, allergies and hyperactivity, see Berry Toxic – artificial colors. Though some claim that sodium benzoate isn’t harmful on its own, Professor Peter W. Piper of the University of Sheffield claims that sodium benzoate by itself can damage and inactivate vital parts of DNA in a cell’s mitochondria. This can lead to cell malfunction and programmed cell death. In other words, Diet Coke is bad, mmmmmmm’k. You might want to think twice before you give your kid mac and cheese for dinner again or buy her that berry-licious cereal. The FDA was recently considering a warning label for foods with artificial colors. That’s because studies show that artificial colors cause behavioral problems and have been linked to allergies in children and cancer (when tested on lab animals). Blue 1, Red 40, Yellow 5, and Yellow 6 have long been known to cause allergic reactions in some people. 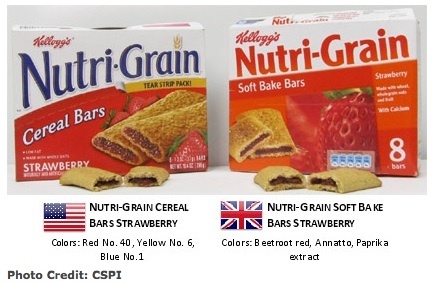 CSPI says that while those reactions are not common, they can be serious and provide reason enough to ban those dyes. Furthermore, numerous studies have demonstrated that dyes cause hyperactivity in children. In addition, according to the report, FDA tests show that the three most-widely used dyes, Red 40, Yellow 5, and Yellow 6, are tainted with low levels of cancer-causing compounds, including benzidine and 4-aminobiphenyl in Yellow 5. Why the double standard? In Europe manufacturers need to prove an ingredient is safe in order for it to be approved for use. In the U.S.A., it’s innocent until proven guilty. 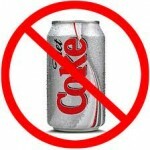 That is, U.S. scientists, researchers or consumers must prove that an ingredient is harmful before it will be banned. Do you really want to keep giving your kids Lucky Charms for 10 years and ‘wait and see’ if any of the ingredients cause cancer? *Read labels! Artificial food coloring HAS to be on the label. You’ll see it listed like this: “colored with (RED 40, YELLOW 5, BLUE 1)” as an example. *Avoid regular food coloring in baked goods. Opt for natural versions instead available in the natural food section of your grocery store or your local natural foods store. *Question brightly colored foods. They likely contain artificial food colorings (otherwise, how could they be so unnaturally bright?). Think rainbow colored popsicles, bright blue frosting, Jell-O, and Fruit Loops. *Shop at your local natural food co-op, Whole Foods, or Trader Joe’s who refuse to sell any food that contains artificial coloring. 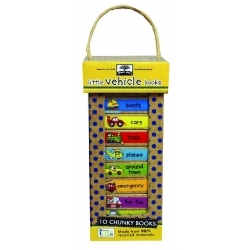 Some smart lady just sent us these chunky Green Starts Little Vehicle Books. They are adorable and safer for your baby to chew on as they’re printed with soy-based ink and made from 98% post-consumer recycled materials (no bleach here). Thanks Elly! Ladies! Before you and your little princess get manicured up for the Sugar Plum Fairy Tea, get some non toxic nail polish, free of known carcinogens such as formaldehyde, dibutyl phthalate (DBP) and toluene, found in regular polish. These ingredients have been linked to problems ranging from skin irritation in people to birth defects in animals. It is particularly important for pregnant women and little girls to try and avoid these chemicals. I like Priti Nails in Keepsake Rose and Pink Jewel Carnation. Many of their colors are on sale now for $8.75. Piggy Paint is also adorable and sure to please little ballerinas everywhere. Check out their cute gift sets. Piggy Paint, nontoxic, odorless, kid-friendly, kid-colored, water-based formula. Honeybee Gardens, an alternative to solvent-based nail polish, water-based, odorless, removes with rubbing alcohol. No-Miss, does not contain the three-to-avoid above, and also does not contain camphor. Acquarella, water-based system of nail polish, conditioner, remover and moisturizer. Suncoat, water-based nail polish that has been recognized and honored from the Canadian Health Food Association Expo. Peacekeeper Cause-Metics, created by the Environmental Working Group as the safest paint-based natural nail polish. Sante, created without the use of formaldehydes, toluene, and colophony rosin. Nubar, carcinogen-free nail care products. Safe Nail Polish, nontoxic, oderless, made in the USA. Priti, nontoxic, made without the evil-three and all know carcinogenic ingredients. Spa Ritual, vegan nail lacquers. Just a quick gift idea – we love these great organic and Oeko-Tex Standard certified baby and kids clothes by Hanna Andersson. The company did a great line for Serena and Lily at $36 each (currently on sale btw) but you can get the $24 version here. This is a perfect baby gift, reasonably priced, functional (easy zip on/off) and adorable!